If you're feeling like your space needs a bit of a change, the farmhouse chic trend is an easy way to capture rustic elegance. With just a hint of country, farmhouse chic is all about comfort and warmth. So, gather some natural wood and metal accents, research a few DIYs, and you'll be able to execute a quick makeover that feels surprisingly professional. 1. Take stock of your existing rustic and industrial items. 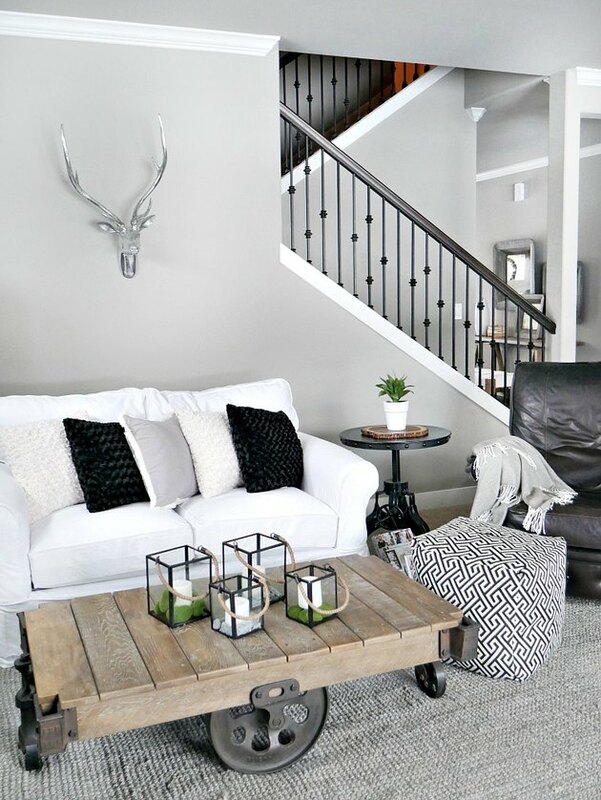 Farmhouse chic is all about taking natural elements and pairing them with certain metals or industrial touches. Work with what's available to you in your home already. 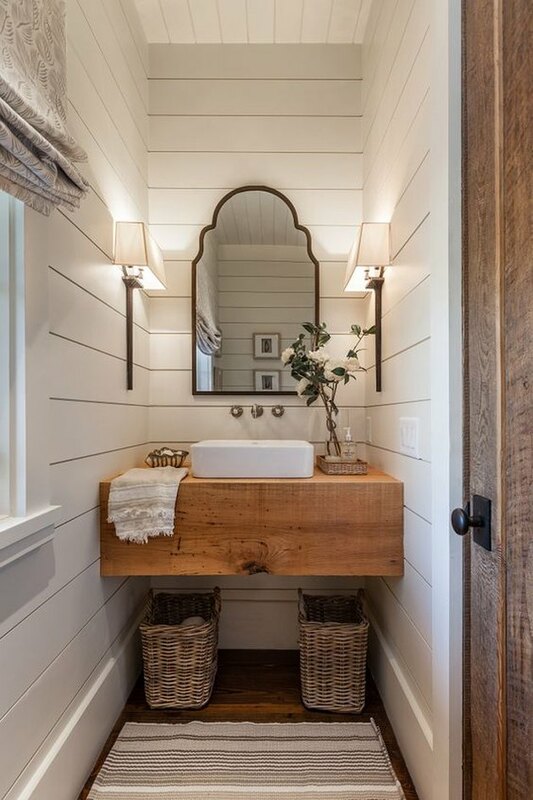 Do you have a shiplap or wood wall? Consider moving darker pieces of accent furniture to that area. 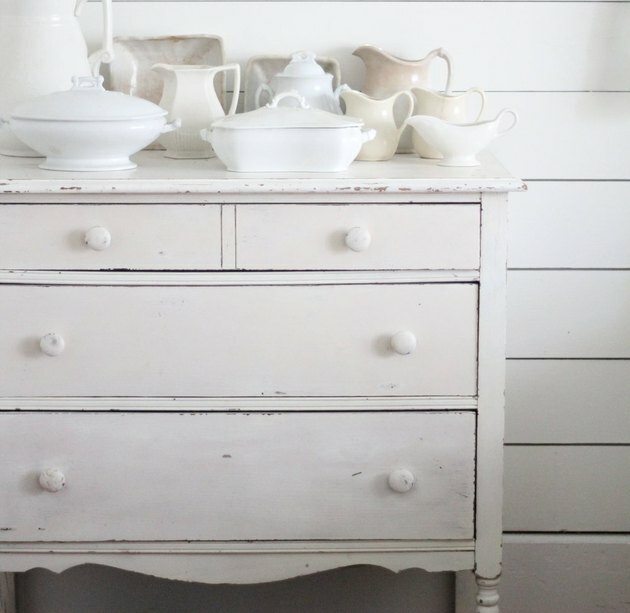 If you're stumped and looking for some great farmhouse inspiration, check out Taryn Whiteaker's gorgeous blog, full of advice and DIYs. 2. Swap out a dull light fixture. The farmhouse ceiling fan is a practical and fun way to add to your new country aesthetic. Play with the hue of the wood stain on the blades to get the right look to go with the rest of your room. 3. Turn a spare glass bottle into a faux sea glass piece of whimsy. A DIY project — like making fake sea glass bottles from Finding Silver Pennies — is a great one to get you started this weekend. You'll never believe that food coloring and some glue made these gorgeous accent pieces. 4. Paint an accent wall in a farmhouse-inspired color. One of the first steps to creating the perfect modern farmhouse look is choosing your color palette. The style is known for its calming neutral colors, but painting a room, let alone the entire house, is a huge endeavor. Consider painting an accent wall that can become the focal point for your space. 5. Put in shiplap accents. For a DIY project that can easily be tackled in a single weekend, Making Joy & Pretty Things has exactly what you need. 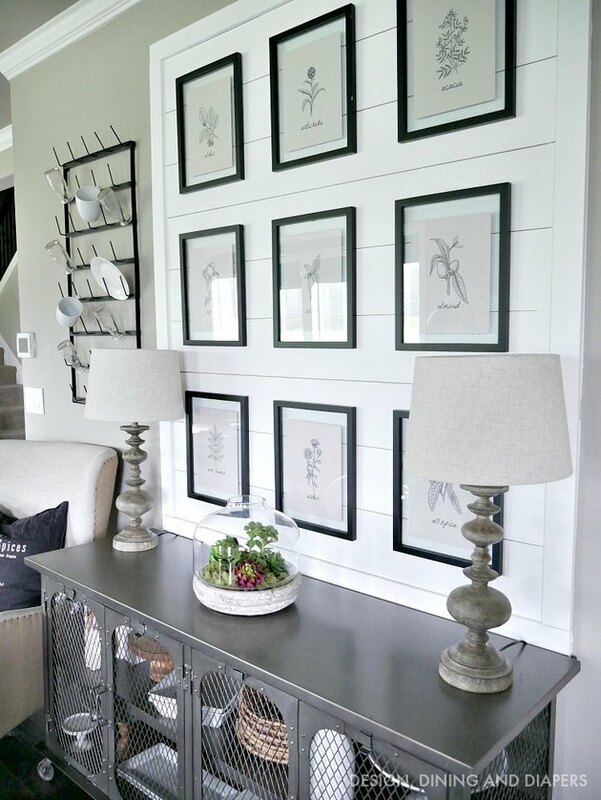 This simple, stylish faux shiplap wall is not only cost-effective, it does wonders to create that farmhouse look you crave. 6. Pick up some accessories that use natural elements. 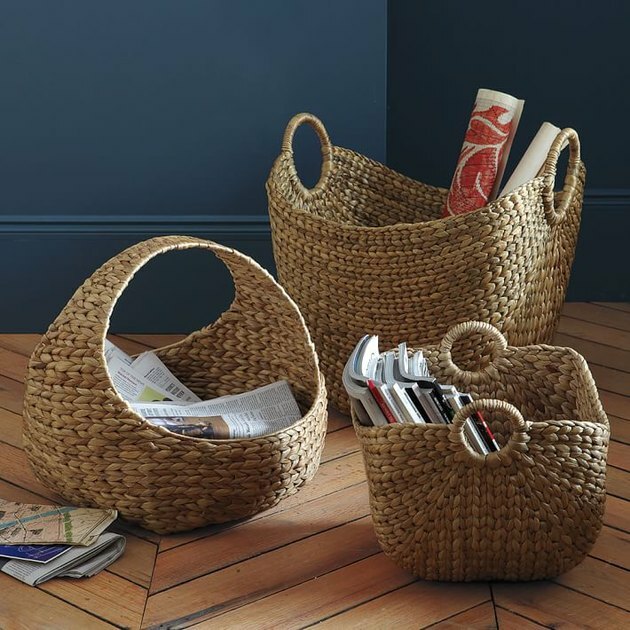 These woven baskets from West Elm ( $54 ) offer storage that brings in natural elements and fun textures. White and off-white hues are central to the farmhouse palette. While completely repainting a kitchen or bathroom is more than a weekend project, look to see what existing accents might benefit from a coat of white paint — cabinet doors, old dressers, chairs, etc. 8. For a farmhouse chic bedroom, try a wood headboard. 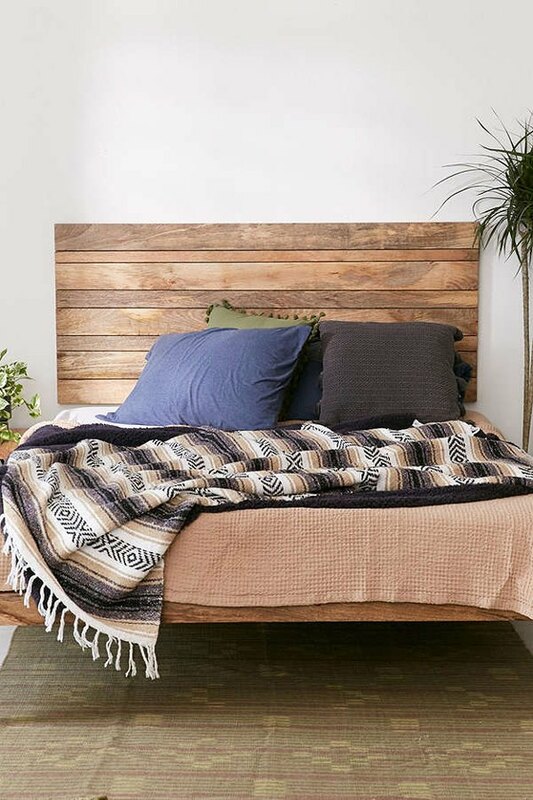 Raw and reclaimed wood are important aspects of the modern farmhouse look and this headboard from Urban Outfitters ( $289 ) is a pretty perfect example of that. Looking to squeeze more out of your budget? You can always DIY a wood headboard. 9. Feeling ambitious? Construct a raw wood plank table. Using raw or reclaimed wood in your decor is essential for any modern farmhouse look. 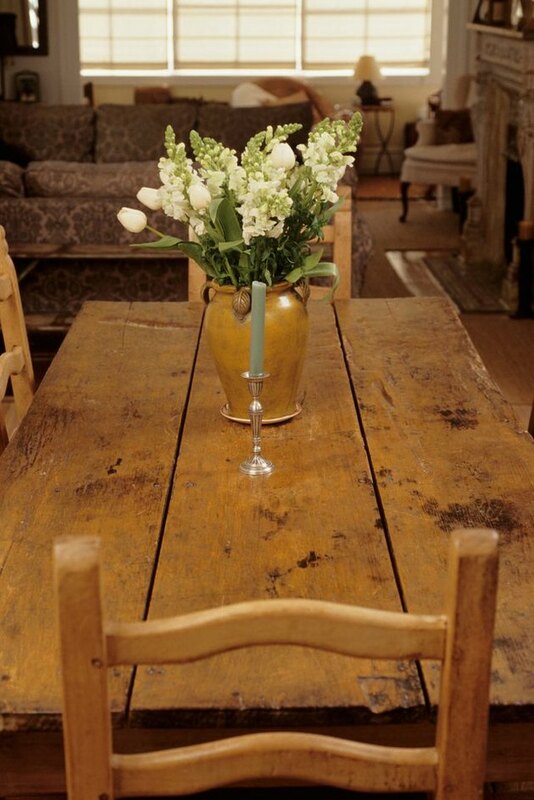 Try this DIY to create a plank style dining table. 10. Hit up your local flea market. While we love flea markets for aimless browsing and general weekend amusement, they're much more fun when you're on the hunt for something specific. Flea markets are a great (and cheap!) 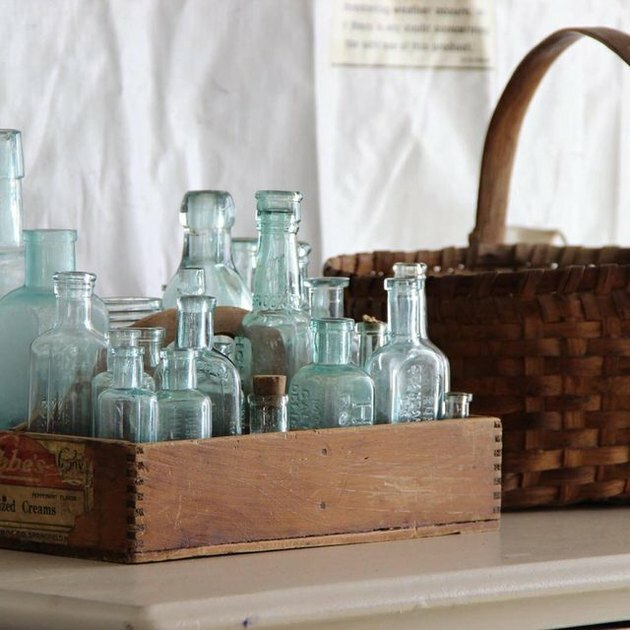 resource for farmhouse-esque finds: Search for antique tools, vintage signs, and old glass bottles. 11. Add in some traditional accents done new. 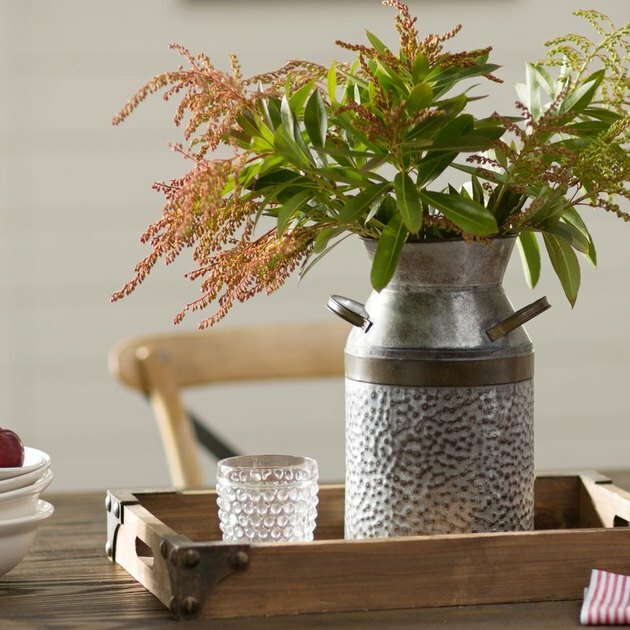 This milk jug table vase found on Wayfair ( $33.84 ) is a classic rustic touch that is takes old-fashioned inspiration without feeling outdated. 12. Update a cabinet with a barn-like door. If you're truly handy, you can absolutely try building your own barn door. The rest of us might want to opt for something on a smaller scale, with easier install. This DIY cabinet door will only set you back $20. 13. Add the right type of candlelight. 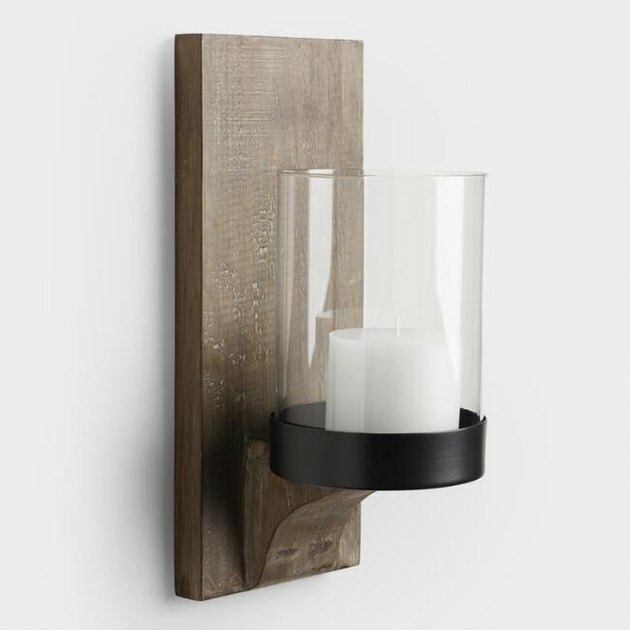 Frame your fireplace or entryway with a pair of rustic wood and glass sconces from World Market ( $24.99 each ) — this minimalist design shows how classy modern farmhouse can be. 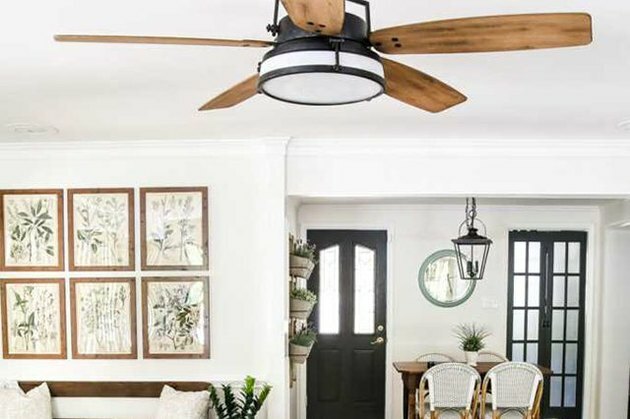 What Is a Farmhouse Ceiling Fan?